A while ago I blogged about Electric Cars, and more specifically about Tesla and some of the charging station issues I observed personal and Tesla was already reacting. Another huge point is the problem of 45 million drivers, 30 million vehicles and the fact their are just 14,000 (currently) charging points in the UK. Just for giggles I thought I would do the maths. It would work out around 2,000 potential electric vehicles per single charging point in this country if every vehicle were electric. Lettts Get Reeeeeaaaady Toooo Ruuuumble, 2,000 range-anxiety fuelled drivers running their engines on sparks, all of them fighting for the only available plug socket?. Given these charge stations are for potentially slow-charge ports, which could take around 5 hours 30 to charge a Toyota Prius and around 7 hours to fully charge a Nissan Leaf. That means that even if people lined up end to end, 24/7, it would still be around 700 to 1 trying to charge at any given time (allowing for differing driving, mileage, etc) which is still hugely unacceptable. 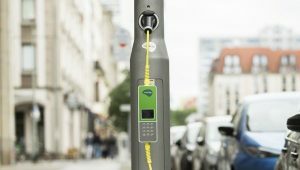 A company called Ubitricity is aiming to convert public lamp posts into public charging points to try and combat this problem. Each of these conversions come in at a cost of £1,000 each to convert an existing lamp post into a charge point verses £6,000 to install a new public charger. I have reached out to Ubitricity to find out if they are slow or fast charge points, and I’ll update, if and when I hear back, given I mentioned charge speed above. You’ll need a few things, an Ubitricity Account, An Ubitricity Charging Cable and potentially an Ubitricity Subscription. The subscription depends on what you pay for your cable. If you pay £199 for the cable, you will have to pay £7.99 a month subscription, alternatively if you pay £299 for the cable, there is no subscription charge. This isn’t the end of the wallet emptying, you will then be charged £1 each and every time you plug your car into the charge point, so even if you only connect for 1 minute, you’ll still be hit with £1 connection fee. Remember that subscription fee, if you pay the £7.99 a month, it then costs you £0.15p per kWh to charge your car, if you don’t pay the £7.99, it will cost you £0.19p per kWh to charge your car. If you leave your electric vehicle plugged in for more than 24 hours you’re charged a further £1, its not clear how often this £1 is charge, but if the Tesla solution matches, you could end up in a world of hurt by morning. At the end of each month, you will be sent an itemised bill, which breaks down your usage, and gives you the total. I thought I’d do some more maths, lets look at a standard 40kWh battery like found in a Nissan Leaf, it would cost you £1 connection fee, then assuming you had 8 hours to wait, and you paid £299 for the cable it would cost you £0.15 x 40 (+10% variance) = £7.60 to charge your Nissan Leaf. If you apply this formula to a Tesla which can have a 85kWh battery, its over £15 to charge your car. An average Nissan Leaf will do around 80 miles per charge, they quote up to 110, but people I have spoken too, tell me it can be as low as 50 miles but usually around 80 miles. I’m going to make the assumption that the charger cable to last about 24 months before needing replacement, so I’m going use a cost of approx £12 per month for the cable just to give it a price for the calculation. I have reached out to Ubitricity to ask what, if any warranty is provided with the cable, based on mobile phone cables used regular, it may have a short life. 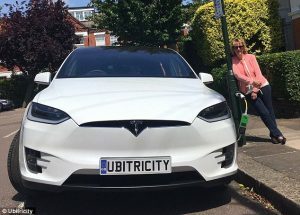 I do approx 500 miles a month, lets convert that approx £0.09.5 per mile, using Ubitricity’s costing, which makes it £47,50, now add on the £12 cable cost, we have £59,50 per month in fuel bills. The Honda Civic is a 1.8l VTEC (Euro 5), I put £50.56 in petrol to fill the tank, I get approx 325 miles, with the range showing 30-40 miles remaining, but I never let it get empty as its bad for the engine. Lets say I get on average 35mpg, which makes the average mile in the car cost £0.14p, which gives me a monthly petrol bill of £72.35. There are far more economical cars then the Civic, the Honda Jazz for example, would cost approx the same amount in petrol as the Leaf does in electricity using the councils lamp post chargers at least. Considering the council say this is renewable electricity, its hella expensive, compared to charging at home, where on average it will cost you around £3.40 per full charge (£21.25 per 500 miles). 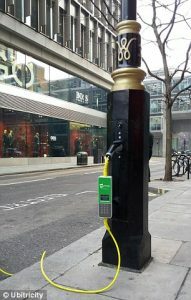 According to the press release these Simple Socket chargers will be located next to pay and display parking bays. I have reached out to Ubtricity for clarification on if you will be expected to pay and display on-top of the charging tariff. In Manchester this cost is approx £3 per hour with 2 hour maximum stays in the city centre. Which means it could end up insanely expensive, more so if they are slow chargers. It does however say there will off-street charging points for residents who don’t have off-street parking, so I would assume regular side streets with free parking will be included.